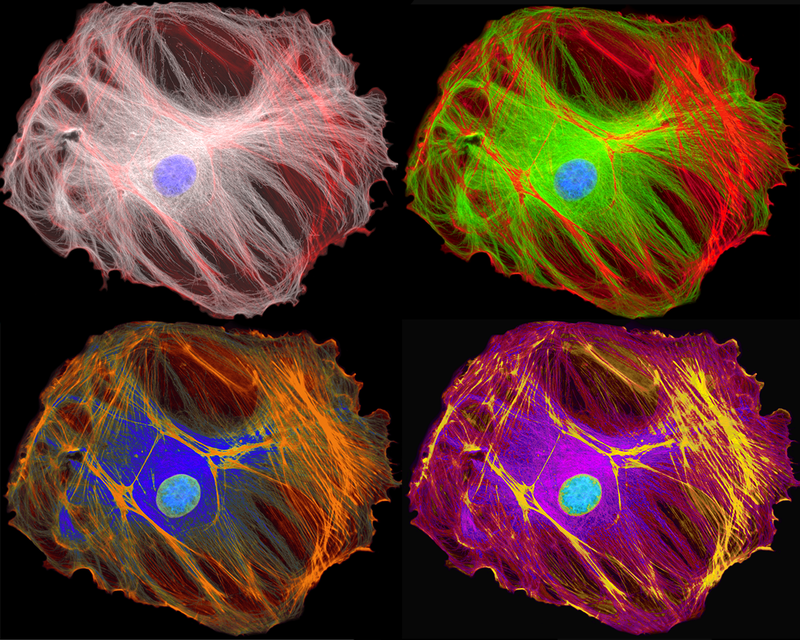 This Bovine Pulmonary Artery Endothelial (BPAE) cell is stained to show two components of the cytoskeleton – microtubules in green, and actin filaments in red (in the top right panel). The cell is a crowded place, so one of the functions of the cytoskeleton is to act as a highway along which cellular components can be moved to the proper part of the cell. This movement is driven by motor proteins, like kinesin, which “walk” along microtubules pulling their cargo along with them. The combination of different cytoskeleton components and different motor proteins allows the cell to control exactly where signal molecules or other proteins are delivered within the cell so that they can have the proper effect. Artwork by Anna Maurer and DWP. To learn more about the cytoskeleton and its role in intracellular transport, click here. Watch an animation of kinesin moving a cargo along a microtubule here.